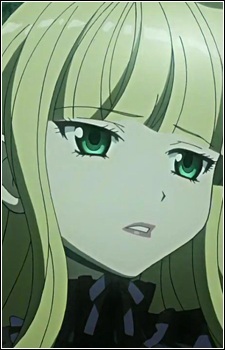 The mother of Victorique. She was a dancer and her home town was the Village of Gray Wolves. It was Marquis de Blois, who told her that he wants to insert the unique ability of Gray Wolves into his aristocratic bloodline. So he made her his... till he discovered her secret - that is she was a criminal. She had worked as a maid at her home town, but one night, she was said to have committed a terrible crime that caused her exile from the village. After discovering that, Marquis regretted introducing their blood into his line. Later it's revealed that the Marquis' version of the story is not true. He first noticed that Cordelia was one of the Gray Wolf people due to the trademark petite stature, long blonde hair and green eyes, and kidnapped her from her boyfriend, Brian, after one of her performances. Then he confined Cordelia and forcefully impregnated her with Victorique. After her difficult birth-giving, the Marquis sent Cordelia to an asylum, where she was rescued by Brian. They started traveling together, and Cordelia often aided Brian during his magic performances. 15 years later, Victorique came to Cordelia's birthplace and found out the true murderer in the crime Cordelia was accused of committing, and cleared her mother's name.